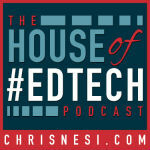 (13:09) House of #EdTech Thought - Do We Need Gurus and Experts? (17:22) Featured Content - It's March Madness time! (29:09) Just Give It A Try - Dan Gallagher shares!